I am trying communication between the PLC and Robotiq Universal Controller . The address specifies 0x03E8 (1000), but is it wrong? Please give me the correct answer address. Modbus TCP doesn't have a standard configuration file like other Fieldbus. They are normally pretty simple to configure on the Modbus TCP client side. Your PLC must have the Modbus TCP client option to get the ability to read and write to Modbus TCP I/O device. These devices are named Modbus TCP server like the Universal Controller for the gripper, it's a Modbus TCP server. In Modbus TCP, input and output registers are in a separate memory area so both of them start at 0. Which is not the case in Modbus RTU. 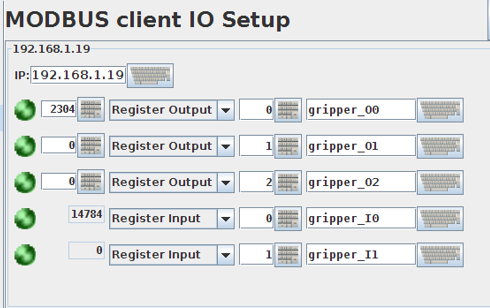 To control the gripper you will then have to access input register starting at 0 and output registers starting at 0. This is Modbus TCP client configuration made on a Universal Robot to communicate with the Universal controller with the gripper at the IP address 192.168.1.19. It writes at the register output 0,1 and 2 and read at the input registers 0 and 1. In Modbus TCP registers are sometimes 16 bits so they will cover 2 bytes each. That the registers of the gripper. In the example above, register output 0 contains 2304 which means: 1001 0000 0000. It indicates that the bit 0 (rACT) and 3(rGTO) of the first byte are ON. If the Modbus client is not implemented in the PLC and you have to write the frame by yourself like this 09 03 07 D0 00 02 C5 CE. Then refer to the link in my previous post to know how Modbus TCP frames are built. the frame 09 03 07 D0 00 02 C5 CE only refer to Modbus RTU and will never get the right answer in Modbus TCP. In this example, 09 means the slave ID in the Modbus RTU. Devices are identified with IP address in Modbus TCP. If your PLC has the Modbus RTU Master option, it will work. If not, it's going to be the hard way and you will have to program yourself this Standard Fieldbus protocol. The easy way will always be to have a Fieldbus <master> on a PLC to connect Fieldbus <slave> like the gripper or any other Fieldbus I/O. Thank you for responding the other day. Thanks to that, the robot hand is running smoothly. It is control that requires. Is it possible to control without this activation operation? What is the state if activation is required? @YOSHIHISA have you looked into the controller online manual? Look into section 4 of the manual. Without anything plug, you should at least be able to read Byte 2 bit 4 to 7 who will return the fault status. Should return 0x00. What have you plugged into the controller? Thank you for your reply immediately. I am using modbus tcp type Universal Controller. I think that wiring is not wrong. I am communicating programming by referring to Chapter 4 of "2F - 85 & 2F - 140 - Instruction Manual". I made an error response when I made this request. A normal response comes back. So I thought that the read address is different between RTU and TCP. As response comes back, I think that protocols etc. are done normally. Please tell me the difference between RTU and TCP. I can not change to a Fieldbus , because the PLC does not support only modbus TCP. If you do not have a modbus TCP configuration, do you know the address of the input output register, do you have any reference somewhere? The PLC side supports modbus TCP, and it seems that reading and writing are possible if only the address is known. I'm thinking of trying a method to directly connect to PLC using RS 485 directly without using a universal controller. Is it possible to connect directly to PLC? Do I need a universal controller compatible with modbus RTU? In that case, will I refer to "2F - 85 & 2F - 140 - Instruction Manual" as a reference? If I connect directly, is modbus RTU communication? Is the slave ID according to the instruction manual? Are the communication speed settings as well as manual?